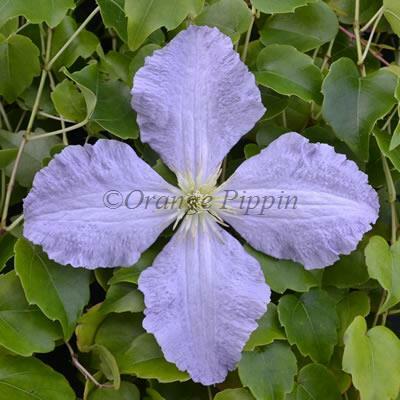 This Clematis is a delightful free flowering variety from the Baltic which covers itself with spectacular, soft, pastel-blue, crinkled flowers with pale yellow centres from July to September, these having an usual way of changing colour in different light conditions. Clematis 'Blue Angel' also known as 'Blekinty Aniol' is a very fast growing non-evergreen climber which would be best planted in a partially shaded spot, grown up a trellis, wall or in a cottage garden where it can grow away happily with ease. 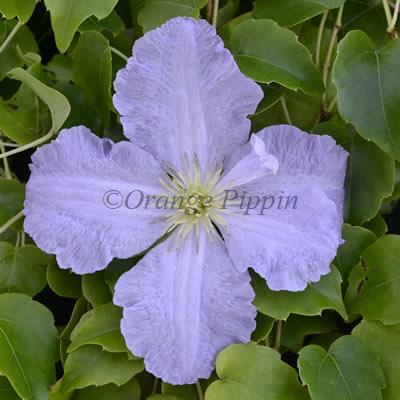 Clematis 'Blue Angel' or 'Blekitny Aniol' was raised by Stefan Franczak of Poland in 1987 and introduced in 1988.